The Synagogue of Etz Hayyim was desecrated within a few days of the arrest of the community on the 29th May 1944. As described by an eye witness, an hour or so after loading the 263 members of the community into lorries – when ‘the bed linen was still warm from people’s sleep’ – first the German soldiers and then non-Jewish neighbors who lived in the Jewish Quarter, were prompted by loudspeakers to seize whatever they wished from the emptied houses. Tables, chairs, linens, cutlery, crockery, and clothes were quickly piled into the street and disappeared almost immediately. By this time, of the two synagogues of Hania only Etz Hayyim had remained. Beth Shalom, the medieval synagogue that had been renovated in the mid-19th century had been destroyed after a direct strike by a bomb in 1941. During the bombing the mehitza (women’s section), built against the south wall of the synagogue and extending over the mikveh, was also so severely damaged that it was razed to the ground. During the occupation Etz Hayyim served the needs of both the Sephardi and Romaniote Jews of Hania. According to one account, several days after the events described above, while the community was still incarcerated at the prison of Ayas not far from Hania, the Wehrmacht soldiers entered the synagogue and all of the religious and liturgical artifacts, books and presumably the archive of the community were removed and dumped into the back courtyard of what is presently the Archaeological Museum (at that time it was being used as a military depot). Their fate is unknown though there are enticing though unverifiable hints that they included tephillin, Siphrei Torah, siddurim and most likely the library and religious textiles. At least one volume of a Talmud was, until very recent times, in the library of the Monastery at Gournia which is now a Greek Orthodox Ecumenical Centre. It bore the ex libris the last Chief Rabbi of Crete Abraham Evlagon who had died in 1933. What appears to be a Sepher Torah and a kettubah are possibly still in the Historical Museum of Hania though neither have been located to date. 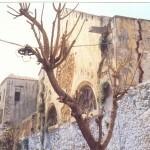 Within a few days of the arrest the Jewish Quarter was re-settled by squatters. The empty synagogue was also given over to squatters who very quickly set themselves to the task of digging into walls, the marble paving stones in the sanctuary and the flagstones of the mikveh in a search for possible buried gold. The three rabbinical tombs in the south courtyard were broken open with sledge hammers and what remained of the burials were scattered in the area. The interior of Etz Hayyim was then divided up by makeshift partitions oddly enough utilizing components from the Bema and Ehal as well as benches. The stone pediment over the main gate was torn down and its sections, including its Hebrew inscription, were incorporated into a fill blocking the opening through which women once looked into the synagogue from the small mehitza located above the shamash’s lodge in the north courtyard. The Ganiti inscription over the entrance to the synagogue proper was gouged out and a lighting fixture set in its centre. The interior of the mikveh suffered no less. An opening was bricked in and a partition was erected cutting off the ritual bath from the dressing area. 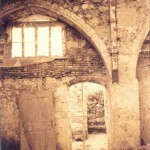 All of the Gothic arches in the synagogue were also filled in with bricks and set with square windows. By 1957 the problem of the unclaimed Jewish property of Hania was in the process of being resolved through the efforts of the last president of the community who had been in hiding in Athens at the time of the arrest. Squatters were given permission to purchase property at nominal prices and thus Kondylakis street formally ceased to be a Jewish Quarter. Only the synagogue of Etz Hayyim remained and by this time it, as in the case of all ‘abandoned’ communal Jewish property in the form of synagogues, midrashim and schools had become the property of the Central Board of Jewish Communities of Greece. The squatters moved out and the synagogue was left to the mercy of the neighborhood. From this date encroachments were made into the two courtyards of the synagogue. In the south courtyard a neighbor surreptitiously set up a small fence that was gradually moved further and further into the area of the rabbinical graves so that by 1990 some 40 square metres had been not only given a fence but had been built into and planted. In the north courtyard, as late as 1994, the adjacent so-called ‘Synagogue Café’ opened three windows that had been blocked up in the 19th century when the property had belonged to a Jewish family. Undoubtedly these windows had been blocked up when the family had acquired the building that had once been the Talmud Torah and hence accessible to the synagogue. By this time the entire neighborhood was undergoing an interesting revisionism. A former soap factory owned by a Jew named Jacob had become a restaurant and customers were being told that it was formerly a synagogue. The ‘Synagogue Café’ appears to have absconded with the name ‘synagogue’ in the hope of commercializing on the ambiguity and was not averse to using decorative images that easily fit into typical anti-semitic stereotypes. What is obviously intended to represent a ‘rabbi’ is used flagrantly on their logo and carte de visite. Nearby another café took on the name ‘Havrah’ (a-Jewish-mad-house-place-of-prayer) which has decidedly pejorative associations for Jews in Greece. In the face of this it is not surprising that Etz Hayyim became a convenient neighborhood dumping ground. Its courtyards were littered with trash, broken bottles, abandoned household utensils, dead cats, and dogs. The sanctuary, by this time completely stripped even of the partitions of the squatters, was at off times used as a kennel, chicken run and then for storing the tables and chairs of a nearby restaurant. It also provided a convenient and sheltered spot for relieving oneself. Ironically, through indifference and perhaps even greed, Etz Hayyim had become a monument to the victory of Hitler and the Nazis. Here in the very heart of what had been the Jewish Quarter was all of the evidence that one needed to see that not only had the Jews all been killed but that their very history (2,300 years of Judeo-Cretan history) was being erased and what remained as a vague and uncomfortable memory for the moment at least, was being twisted to conform to cheap commercialism. It was in this spirit that the credibility of the reconstruction of this sacred place became a matter of necessity. In 1995, a special seminar was held in New York under the aegis of the World Monuments Fund. The International Survey of Jewish Art was the organizer and the subject was “Endangered Jewish Monuments.” Nicholas Stavroulakis was invited to present a paper and the subject chosen was The Synagogue of Hania. Not long after the seminar it was announced that Etz Hayyim had been selected as one of 100 endangered sites in the world for immediate conservation by the World Monument Fund. The outgoing President of the Central Board of Jewish Communities of Greece Mr Moise Maissis and his successor Mr. Moise Constantini both approved the project and it was immediately set in motion. Nicholas Stavroulakis was to be the project director and coordinator as well as fund raiser. The initial funding was provided by Lord Jacob Rothschild and the Hon. Ronald Lauder. What made immediate work most pressing was an earthquake that struck Hania in 1995. 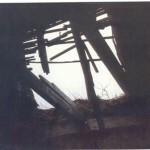 Within but a few hours fissures appeared in the supporting walls and a section of the roof collapsed bringing down the ceiling. It was imperative that work begin immediately. What was essential from the very beginning was the necessity to clarify what was being done. There were several points of view to be considered. Were we doing a work of conservation, reconstruction, restoration or renovation? The former approach to the site was not acceptable in many ways as it required the saving of the very signs of neglect and will-full destruction and desecration that had marked the building since 1944. Sufficient evidence had been destroyed so as to make a restoration impossible. There was sufficient evidence, however, that Etz Hayyim had been renovated a number of times – once in the 17th century, again in the 19th and even as late as 1904 there were projects carried out to accommodate the synagogue to the contemporary needs of the community. Our task was quite simple once formulated: 1) to strengthen the building structurally to make it sound and earthquake proof, 2) to erase the signs of desecration, neglect and indifference that had marked it since WW II and 3) to make it a living synagogue open to a future that hopefully would see Jews pray in it but also 4) to keep alive the memory of our community that perished in 1944 and 5) that it bear witness as the sole remaining Jewish monument on Crete of the 2,300 year history of its Jews.  On the 10th October 1999 some 350 people assembled in Hania to participate in the installation of the Siphrei Torah in the new Ehal of Etz Hayyim. Rabbis Jacob Arar and Isaak Mizan of Athens were the celebrants assisted by R. Yacob Dayan of Salonika. Honouring us by their presence were the Capuchin Friars of the nearby Catholic Church as well as the Sisters of Charity (of Mother Teresa) and the Ambassador of the German Federal Republic. The Hon. Constantine Mitsotakis, the former Prime Minister and President of the New Democracy Party of Greece, was also in attendance along with all of the presidents and many members of Jewish Communities in Greece. From the date of the re–dedication the Synagogue has slowly but constantly made its presence emphatic. For ‘locals’ it has provided an important opportunity to link themselves with a past that was almost forgotten, a past when pluralism was still a vital element in Haniote life. For the Jewish communities of Greece it is certainly the first attempt to actively explore what role we can play as Jews and as a Jewish presence in a predominantly Christian Orthodox society. This entails as well a certain amount of experimentation within rigidly halachic limits. The synagogue has managed to function during almost all of the Jewish Holidays and especially at Pesah and Sukkoth in keeping with the spirit of these festivals our Christian neighbors and friends are invited to participate in our rituals. Our annual Seder is usually attended by over 60 people and for Sukkoth a community buffet is prepared in the Sukkah erected in the south courtyard. In mid-winter of 2001 a retreat was conducted in the synagogue that lasted a week; its theme was “Prayer and the Approaches” to God and was led by Fr. David Burrell of Notre Dame University. Some 25 people attended the evening discussions that were centered around the persons of Etti Hilsum, St. Terese of Avila and Jalal ad-Din Rumi. Etz Hayyim slowly evolves a life of its own as a Jewish presence and witness to the long and vibrant history of the Jews of Crete. Symbolic of the tent of our father Abraham its doors welcome all who share the values of mercy, justice, compassion and love of our fellow men. 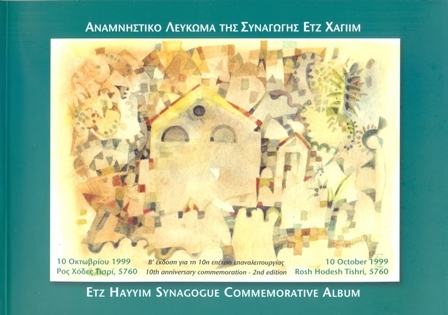 A full account of the reconstruction is given in the Commemorative Album; available against donation from the Synagogue. In the section “News and Events” you can read about our ongoing activities. Nikos Stavroulakis has given numerous presentations on the renovation of Etz Hayyim Synagogue, e.g. at the Borderland Foundation in Sejny, Poland, at Ludwig Maximilians University Munich and at the École française d’archéologie d’Athènes.